Pricing includes delivery, setup, and pickup for most of the Kansas City Metro area. 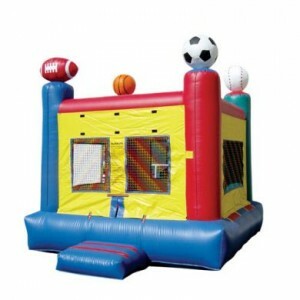 This sport themed bounce house is sure to please the sports fan kids party that you are intent on hosting. This item is priced lower than many of our other bounce houses because it has a few cosmetic blemishes. There is some discoloration on the yellow areas of the unit, these are the most notable faults. It is great for parties on a lower budget, or because you know your kids are going to have a blast anyway. Standard size bounce house approx 15×15 foot print. In order to reserve bounce house or water slide rental for your event, please send us an inquiry to confirm exact pricing based on your location and event time frame. Remember to include the following details with any inquiry so that we may properly respond to your request. Deposit must be paid in advance to hold a reservation. This amount comes off the total rental cost. This deposit is non-refundable, with the exception of immanent bad weather during your event. In the event bad weather is expected we will be close contact with you before your schedule rental to confirm that your party is still going as scheduled. Once we arrive at your location, the full amount of the contract is due, no refunds. Please be sure about your decision making, if we setup an inflatable and you ask us to move it, you will be charged an additional $50 setup fee. Inflatables are not easy to pack-up and move around, they are bulky, heavy and time consuming. It is very important that you be sure about the setup area the first time. Electricity & Water requirements: This is your responsibility! Each inflatable requires power for the blower(s). Each blower uses between 7 & 11 amps of power (110-120 VAC). Larger units require two – four blowers. You will need to make sure you have enough “Separate Circuits” for us to use for power. More than two blowers will trip breakers every time. Some building or power receptacles are only adequate for one blower at a time. Be prepared to rent a generator in the event there is not enough power for us. We will tell you in advance how many different circuits you can expect to provide. We can provide generators if requested in advance for a fee(depends on amount of wattage required for your event). Water Rides and Dunk Tank require water to be used. Make sure you have access to a pressurized water source, such as building spigot, firetruck, giant elevated water tank, etc… You’ll want to make sure the source is close to the setup area, to ensure fast setup time, please have a hose hooked up and placed close to the setup location ready for use. These items will help tremendously with providing you an accurate estimate. We at Affordable Inflatables of Kansas City take pride in our business and customers. We are committed to providing you fast, punctual, honest, professional, reliable service. It is our goal to make sure every event that we are hired for is a success. Many other inflatable rental companies in Kansas City have built a reputation for missing rentals, forgetting appointments, providing the wrong rental items and overcharging for sub-standard service. Rent with Confidence, Rent with Us.